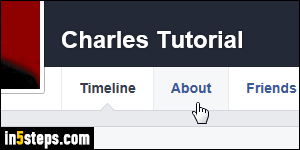 Your exact birthdate is collected when you first create your Facebook account: your birth year and birthday (month / day) are stored separately. 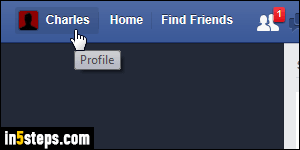 That lets you show your birthday on your Facebook profile, and hide your age. 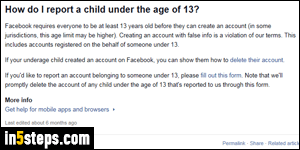 Both can be made public, or both can be private (visible to you only), but they have to be supplied: part of the reason is that there's a minimum age to sign up for Facebook, and age restrictions to access various kinds of content on the site. Once logged into your account, click on your first name in the blue toolbar at the top: this load your profile as seen by others, except that you can edit it. Click on the About link next to the Timeline, as shown on the screenshot. Your About section opens, with Overview automatically selected. Click on the "Contact and Basic Info" link (three links down). Under Basic Information -you may need to scroll down a bit to see that section- you'll see your Birth date and Birth year. 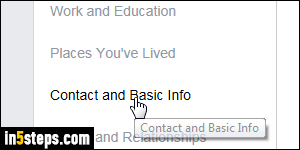 The two are kept separate: your birthday is optionally visible to other Facebook users, or at least your friends. Your birth year is always hidden by default. It can be used to grant access to age-limited content or apps. Move your mouse above your birth day or year, and click on the Edit link to change it. A popup will open with three dropdowns, allowing you to change the month, date, and year. Pick your new values. Before clicking on the Save Changes button to apply that new birthday or birth year to your profile, notice the padlock icon next to each one. 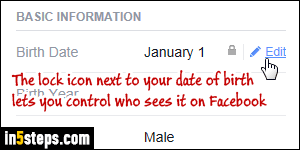 Click on it to control who can see your birthday or birth year: "Only Me" (private), "Friends", or "Public" (everyone).